A Danish Valentine: Butter Cookies, Woven Hearts, and Love! 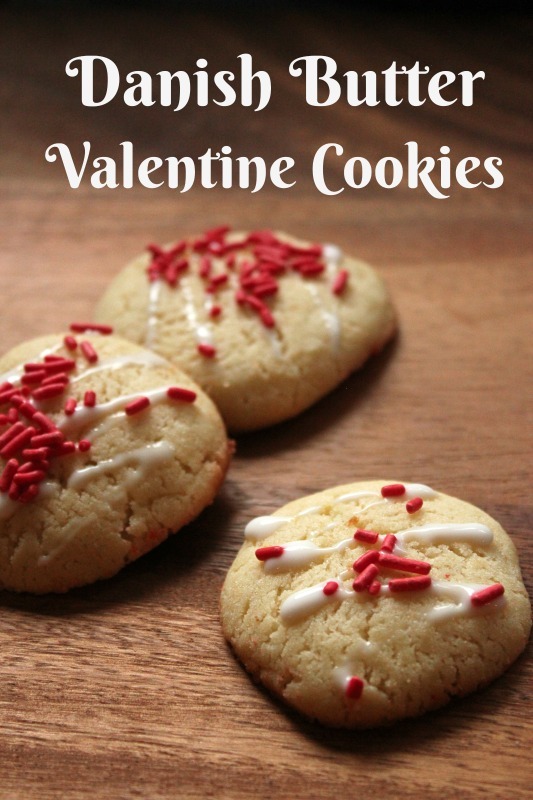 Valentine's Day is such a fun holiday to celebrate with kids. It's also an amazing time to share some of my favorite Danish traditions. Why? Many of the symbols and recipes of my Danish family involved hearts -- which makes them ideal for sharing on this day of love! I wanted to make the holiday very special for my kids this year. Now, it was time to get crafting and baking! 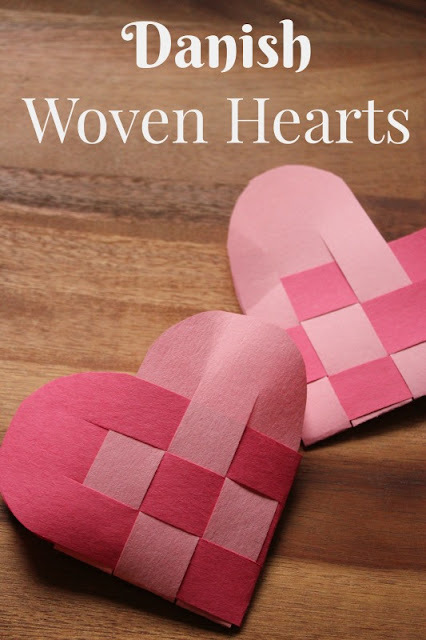 I decided on two project ideas: Woven Hearts and Danish Butter Cookies. Both were favorites of mine, and they were super easy to put together. Combine the wet ingredients (butter, vanilla, egg) with the sugar until creamy. Slowly fold in the flour until just blended. Using a cookie scoop, grab spoonfuls of dough, and roll in your hand until round. Place on a greased cookie sheet (or better yet, one lined with parchment paper) and bake in a 350 degree oven for 12 minutes or until slightly brown on the bottom. For the icing, mix together 2 tablespoons powdered sugar with 2 tablespoons milk. Drizzle on the cookies with the tines of the fork. Add red or pink sprinkles before the icing dries. 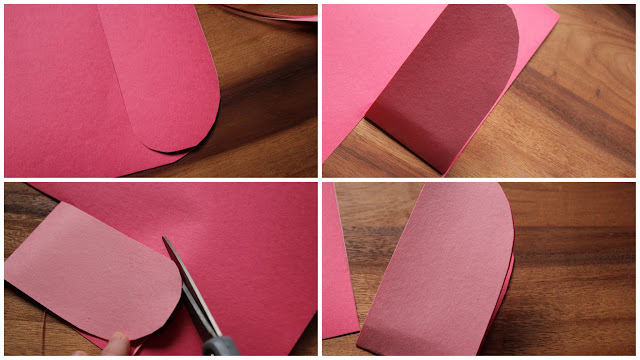 You'll need two sheets of colored construction paper (I chose red and pink) and scissors for this. 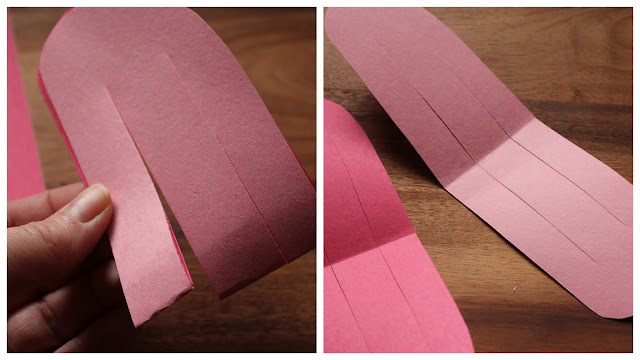 Lay one sheet on top of the other, and make a long cut into the paper with a rounded end. Think of it as cutting out one long rabbit ear. Before finishing the cut on the other end of the rabbit ear, fold the paper in half. You will use the first rounded edge as a pattern for the other rounded edge. When finished, you should have one long oval shape folded in half -- identical at both ends. Now, it's time to weave! 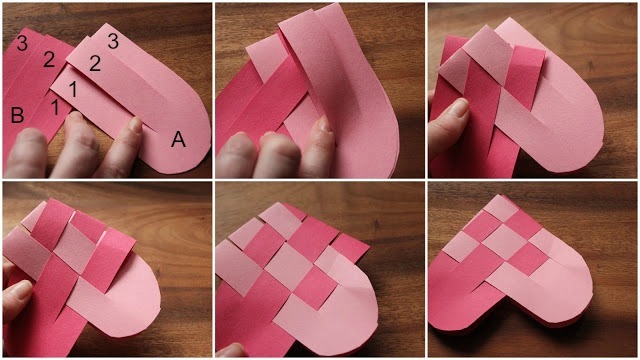 If you've ever woven paper as a child, this should be easy for you. It can be a bit tricky to get the paper placed correctly the further you get into the project, so just take your time and be careful not to rip the paper. Starting with the first "finger" of one of the hearts (heart A), place it on the outside of the first "finger" of the other heart (heart B), as shown. Then, you'll place that same first finger A in the inside of the 2nd finger B, then on the outside of the third B. For the 2nd Finger A, place it on the inside first, then the outside, and so on. You should be able to see right away if your fingers are placed properly. Weaving is easy to see if you have missed something. As you weave, you will find that it is harder to find room to isolate each finger. It may help to keep both colors at a diagonal from each-other. When all finished, you can pull each piece by the rounded part until it is tight and and the "heart" forms. The hearts make the perfect place to hide some sweet treats (like our butter cookies)! Some kids are going to be very happy this Valentine's Day!